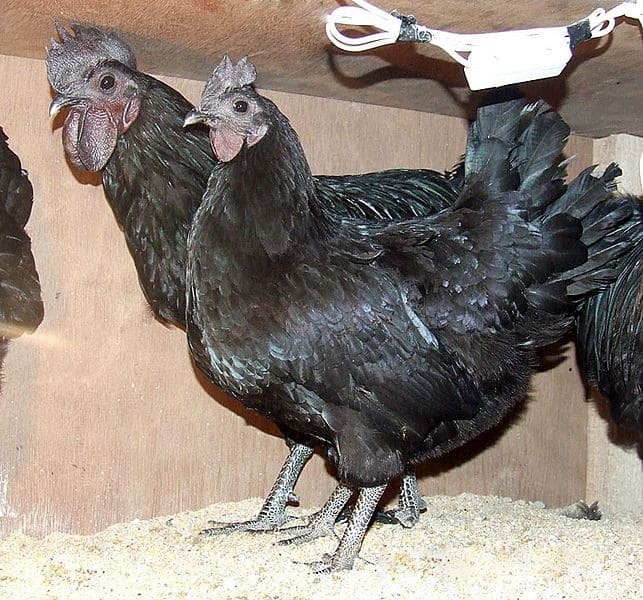 Whilst quite a few breeds of chicken come in black varieties, there are certain breeds that really stand out! Some black chickens are completely black, even including their meat. 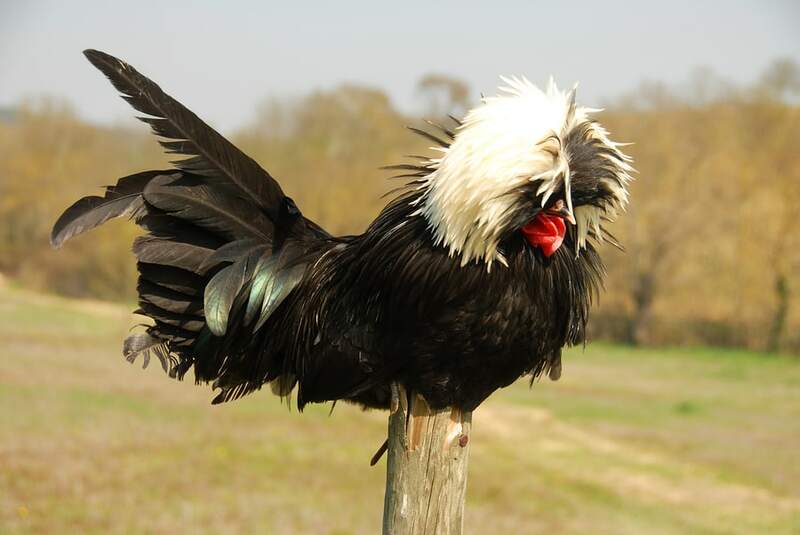 Here are the top most interesting and unique black chicken breeds. 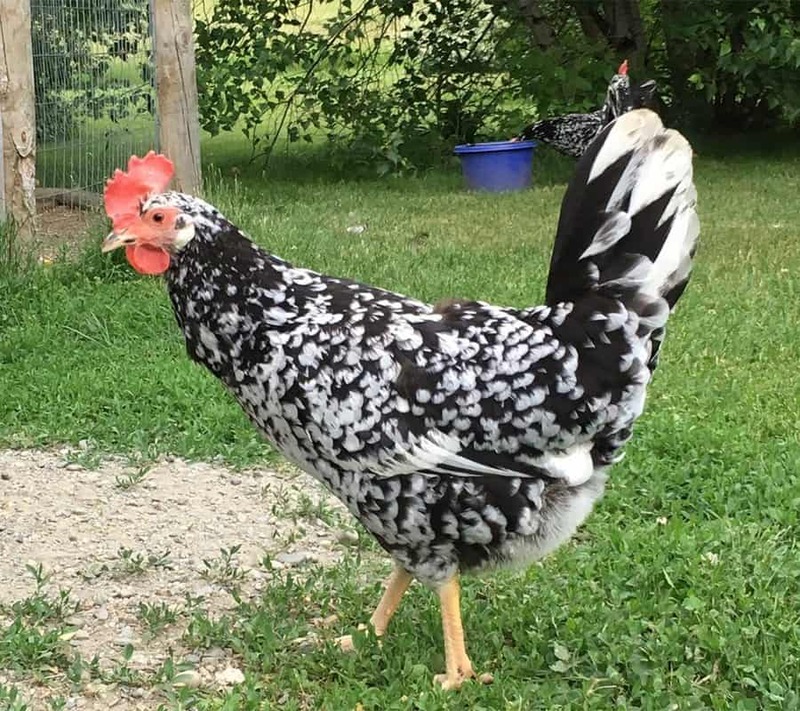 The Ancona chicken breed is most notable because of its speckled pattern. Its feathers are black with bold, white tips. As the chickens get older, their white speckles become bigger and more noticeable. They have yellow legs and feet which are featherless. Anconas originated in the province of Ancona, Italy. They arrived in England in 1888 and are now a very popular breed. There are also bantam Anconas. Anconas are great egg layers. They are a small chicken that flies well and dislikes being left all day in chicken coops. 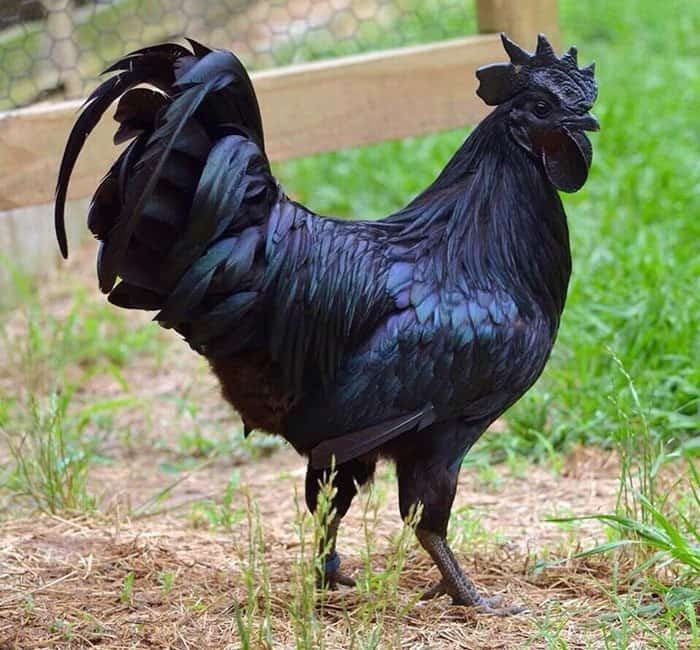 The Ayam Cemani is the blackest chicken breed in existence. It is completely black, inside and out, except for its blood which is a very dark red. The feathers have a metallic green sheen when in the sunlight. The breed is native to Indonesia. They are believed by many to bring good luck and are used in traditional medicine. The breed is growing in popularity in the West due to the novelty of it being so black. Ayam Cemanis can be very expensive due to their high demand. Ayam Cemanis are kept for ornamental or meat purposes. They lay eggs in cyclical patterns, laying 30 or so eggs then stopping for a while then starting again. Their eggs are white in colour. The Jersey Giant is the world’s largest chicken breed! The males can grow to 6kg and the females to 4kg. The black variety was bred first in 1870, in New Jersey, USA. This was followed by the white then blue varieties. They have long necks and wide bodies. The black Jersey Giant has black feathers all over. It has black, featherless legs and red wattles, comb and ear lobes. Jersey Giants are bred for both eggs and meat. They make great backyard pets as they are gentle, friendly and approachable. They prefer cooler climates and cannot fly. All varieties of the Kadaknath chicken breed have black meat. The meat is valued for its nutritional benefits including being low in fat, high in protein and low in cholesterol. It is also prized for having a good flavour and is believed to have medicinal value. In regards to feathers, there are three varieties – jet-black, golden and pencilled. The jet-black variety is completely black, including its feathers, feet, comb and wattles. The breed is native to Madhya Pradesh in India. It is a rare breed. Kadaknaths are also good egg layers. 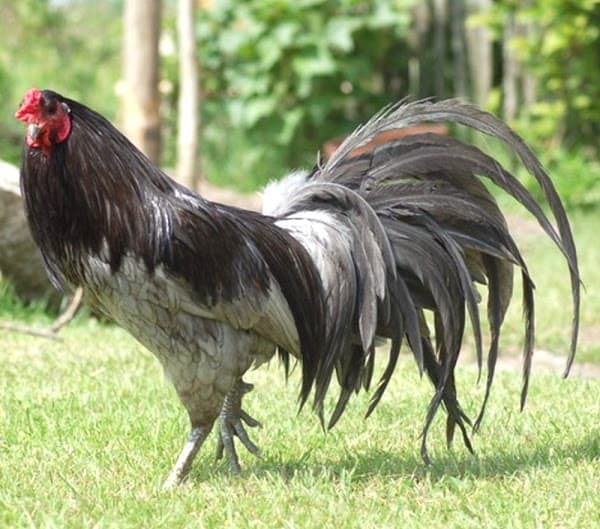 The Sumatra chicken is a rare, ornamental breed. It is most recognisable by its very long tail feathers. Black is the only feather colour officially recognised although white and blue varieties do exist. There is also a bantam version. Sumatras are native to Indonesia. They were originally bred for cockfighting. The hens are poor egg layers. They are very active, jumping and flying well. They require a large amount of space to roam around in. The Svart Hona chicken breed, also known as Svarthöna or Swedish Black, is completely black. This includes their feathers, bones and meat. It is a small and rare chicken breed. There are no other colour varieties. 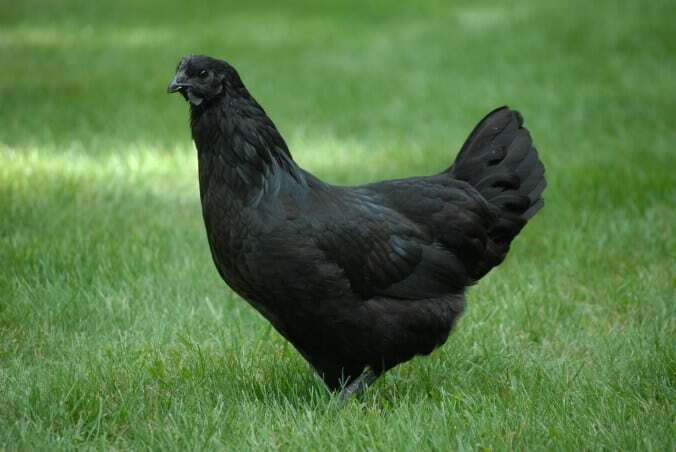 It was first bred in Sweden in the 17th century, crossed between the Ayam Cemani and smaller local breeds. They are great egg layers. They are a friendly breed, particularly the hens. They handle cold climates well although can be prone to getting frostbite on their combs and wattles. Polish chickens come in many variations. The White-Crested Black Polish chicken is distinctive due to the crest of white feathers on its head. This contrasts against its dark, black feathers. They have bright red comb and wattles. Polish chickens originated in Europe although it is unclear where. They are named ‘Polish’ as their crests resemble caps worn by Polish soldiers. There is a bantam version. They are an ornamental breed. They are often used as show chickens but also make great pets. Their crest feathers can sometimes block their vision and will need to be trimmed regularly. They are friendly and tend to be skittish. 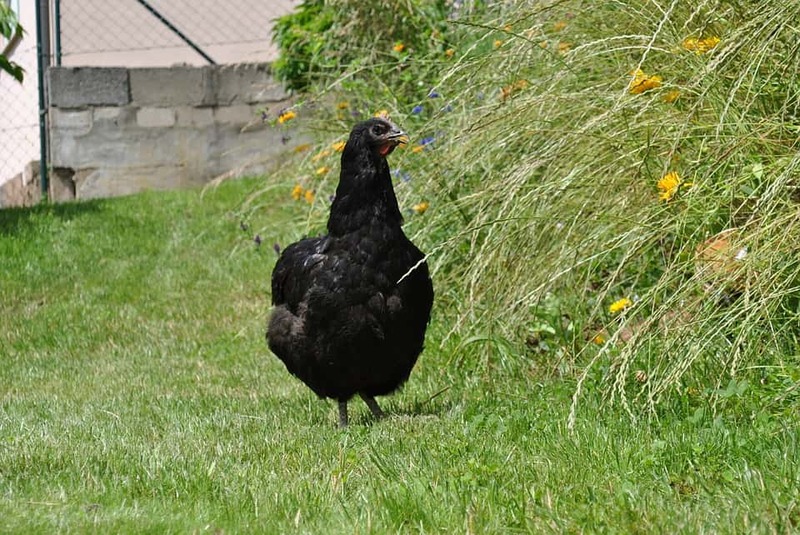 This entry was posted in Chickens and tagged asutralia, black, black chicken breeds, breed, chicken. Toni has a lot of experience with keeping pets and pet enclsoures, with her very cheeky British shorthair cat named Charlie and a rescue cat Rosie who is now nearly 17.Toni's pets also includes Dwarf Lop rabbits and Australorp cross Chickens.